More than a week after it was reported in the Hollywood trades and beyond that Looper opened with a record-smashing debut in China, there is still no official word from SARFT as to what actually happened at the PRC’s multiplexes. In a country where the designated president-to-be can disappear for 10 days without feeling the slightest obligation to explain or even acknowledge his absence, I suppose it’s too much to hope that timely box office reports might be delivered during a holiday week. In the absence of official word, I’ll go out on a limb and offer my best guess as to what did occur in China over the past week and a half. Bear in mind that the figures below are only as accurate as my back-channel sources. Official numbers should be out in the next day or two, at which point I’ll provide an update. First, Looper did open well in China, but it came nowhere close to the US $25 million figure that was initially reported by the Hollywood trades and picked up by more than 100 news outlets around the world. While the film did set several notable precedents, it didn’t break any box office records, and it now appears that my initial estimate of $4.3 million for Looper’s opening weekend was just about right. The National Day holiday week of October 1st through 7th saw roughly $60 million in aggregate ticket sales, making it only the 8th best week of the year so far. Given the high expectations exhibitors had coming in to the week, they were likely disappointed by this result. China’s year-to-date box office tally probably reached, or at least came very close to, the $2 billion mark last weekend. By the third week of October it will surpass last year’s record total of $2.06 billion. Had it not been for the bucket of ice SARFT dumped on the country’s sizzling box office growth by imposing its 2-month summer blackout of Hollywood blockbusters, the year-to-date total would now be more than $2.2 billion and China would have a shot at cracking $3 billion by year’s end. As it stands now I’m projecting a year-end total in the $2.7 billion to $2.8 billion range. While China’s film bureaucrats continue to revise their priorities and tactics, two North American companies and one partially American one have exhibited great savvy in maneuvering through the ever shifting political sands of the PRC. The two aforementioned North American companies are IMAX and Twentieth Century Fox. Both companies have made substantial investments in China and have been smart about how they conduct their business there. IMAX picked a winning film and a winning strategy when it decided to back the Huayi Bros action-fantasy film Taichi 0 with a large format theatrical release. IMAX was unquestionably a major factor behind Taichi 0’s winning box office performance. And Fox made the right move when it submitted Europa Corp’s Taken 2 as a French, rather than an American film, enabling that picture to slip through the holiday blackout and open on Sunday. Its estimated $2.3 million opening day bodes well for Taken 2’s China run. The ‘partially American’ company I’m referring to, DMG, is a Beijing-based Chinese company that has strong American representation among its senior ranks. 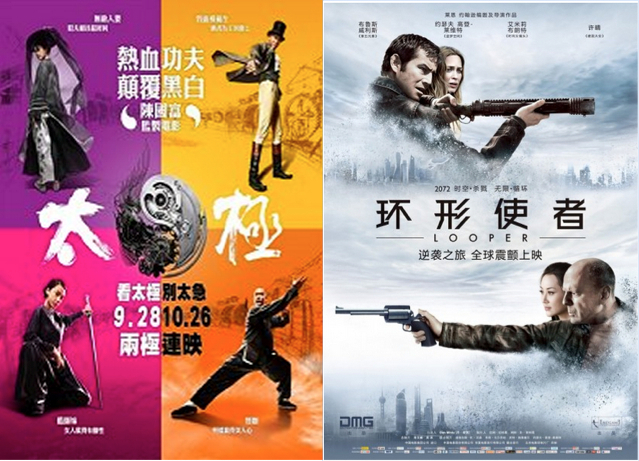 DMG pulled off several coups with Looper last week, getting a film that was clearly American (with Chinese flavor) released during a blackout week when Hollywood studio films were strictly prohibited. DMG also managed to obtain for Looper the first U.S.-China day-and-date release since Madagascar 3 opened in June. And DMG’s connections enabled it to achieve a strong screen count during an extremely competitive frame, and should enable it to keep the film running longer in China than most other American films. Although Looper’s China gross won’t come close to matching its U.S. total, it will likely wind up as one of the best indexing U.S. films in China this year. Also of note: Lionsgate’s The Expendables 2 ended its spectacular run on Sunday, winding up at an estimated $53.6 million, which would put it ahead of The Amazing Spider-Man and just behind The Dark Knight Rises for China’s 9th best performance in 2012. Not bad for a film that grossed $84 million in North America. This entry was posted in Box Office Reports, Opinion and tagged China box office, Dangerous Liaisons, DMG, Double Xposure, Europa Corp, Expendables 2, Huayi Bros, IMAX, Looper, Rob Cain, Robert Cain, SARFT, Taichi 0, The Assassins, Twentieth Century Fox by chinafilmbiz. Bookmark the permalink. So, it’s possible that Fox did not have the China distribution right and EuropaCorp, or perhaps another distributor submitted the film for the China release, in which case then it is proper to consider TAKEN 2 as an imported film from France.